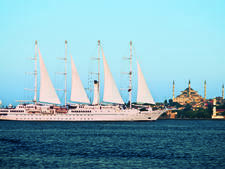 The stunning five-mast, seven-sail Wind Surf takes the prize of largest vessel in the Windstar fleet. Built in 1990 as Club Med I, the ship joined Wind Star in 1998 and most recently received an update -- including light cosmetic work -- in November 2016. There's a well-to-do, country-club feel onboard. From the gorgeous Yacht Club -- with its plush deep-blue armchairs and stacks of luxury coffee table books -- to the outside bar at the aft of the ship, where passengers can be found socializing over sundowners, the ambiance is upscale, but relaxed. There's no pressure to dress formally for dinner (most passengers keep it on the elegantly smart side), nor is there a jam-packed entertainment program. Instead, Wind Surf's atmosphere is low-key, with passengers free to do as they please -- spending leisurely time onshore and on deck -- without fear of missing out or being overscheduled. Wind Surf is a small ship with many intimate spaces and a dearth of crowds, yet it still offers ample dining options and spacious public areas. On our full-to-capacity-sailing, the only time the ship felt crowded was at breakfast, when you would occasionally find yourself dining with fellow passengers due to a lack of free tables. There's an excellent choice of evening mealtime options -- four if you count room service -- and not once did we wait for a table or run into overcrowding. A highlight of any Wind Surf sailing is seeing the ship's beautiful sails in action. They're stunning, and there's a genuine sense of excitement when you see them go up for the first time. Controlled directly from the bridge using hydraulics, they're capable of generating speeds of up to 12 knots, without any supporting engine power. The fact that the sails are computer operated doesn't detract from the romance of their presence. Don't miss the chance to sit out on deck and watch them in action -- particularly if you can snare the perfect Caribbean or Mediterranean sunset at the same time -- as the ship sails away from port. On the downside, service on our cruise was inconsistent. Servers seemed hurried over breakfast; we didn't always find it easy to catch the attention of a crew member to place an order, and sometimes had to wait a long time for an order to arrive. On the flip side, we were greeted by name and breezily served by the extra-friendly crew just as soon as we were seated in AmphorA and the Yacht Club. Given the ship's high crew-to-passenger ratio (there's roughly one crew member to every two passengers), we anticipated a more seamless and efficient level of service overall. Despite Wind Surf's recent refresh and overall upmarket feel, the ship's corridors and stairwells -- areas that first greet embarking passengers -- and the spa could benefit from a cosmetic update. The older ship is also not an ideal choice for anyone with mobility issues, as there are numerous yacht-like raised doorways. 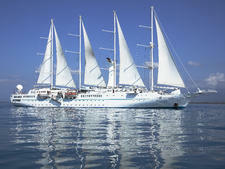 In fact, the line does not promote any accessible cabins on Wind Surf. There is an elevator, though we found it busy at certain times of the day. A final point to note: A ship this small rocks and rolls in stormy weather, more so than a mega-ship. Don't forget to pack your seasickness meds and, if you have a sensitive stomach, pick an itinerary that is less likely to encounter choppy seas. 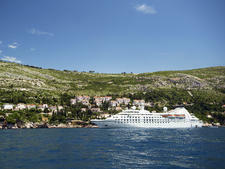 The majority of the ship's passengers are from North America, as were the majority of fellow passengers on our sailing. Expect small numbers of European and Australian passengers, too. Depending on the ship's itinerary, you might find a higher percentage of passengers from certain countries. On our sailing in Southern Spain, we noticed a handful of Spanish passengers onboard, for example. All announcements are in English. The age range skews toward 60-plus, though you'll find families and couples of all ages onboard. (Windstar makes it clear that its fleet is not geared toward children.) 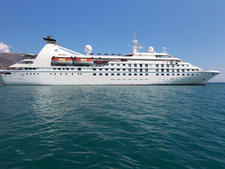 Expect to meet repeat passengers who are loyal to Windstar. Cruise Critic’s professional photographers and our extraordinary community members have taken 1,448 pictures of Windstar Wind Surf. When you visit our photo galleries, you can be assured that what you see is what you get. Wind Surf is known for its casual dress code. Don't be surprised to see passengers wearing gym gear and casual cargo-style pants and shorts throughout the day and into early evening. Sturdy walking or running shoes are recommended for shore excursions. At night, the relaxed theme continues, with the ship enforcing just a few stipulations in the restaurants during dinner. At AmphorA and Stella Bistro, the dress code is always casual elegant. Think stylish two-pieces for women and a shirt paired with smart pants for men. Jackets and ties are optional. If your preference is to wear them, you won't look out of place. No blue jeans, sneakers, shorts or flip-flops are permitted. At Candles alfresco restaurant, a smart-casual dress code applies. Some shorts -- but the tailored kind -- are permitted. No flip-flops, blue jeans or tank tops. In the evening, don't be afraid to embrace the yacht-club feel of Wind Surf and invest in boat shoes, collared shirts and linen-wear. 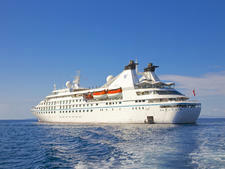 All dining venues and soft drinks are included in the cost of a Windstar cruise. Windstar also includes a handy bus shuttle service into the center of port, where necessary. Alcoholic drinks, Wi-Fi, excursions and gratuities are extra. A daily gratuity of $13.50 per person per day is added to passengers' onboard accounts. In the spa and hair salon, a 15 percent gratuity is added to the bill. The onboard currency is U.S. dollars. There's no currency exchange facility onboard, though the ship accepts all major credit cards and cash.